and giving a nod, up the chimney he rose..."
The tradition of hanging a stocking by the chimney is one without a clearly defined past. Folklore and fairy tales are credited as much as (if not more than) history. Much of the tradition seems to center around Saint Nicholas, a Turkish Bishop that lived in the fourth century and was known for his generosity and kindness. The story goes that, on one of his trips through a small town, Nicholas learned of a widower in the town who had three daughters. As the man had no money for the girls dowries, it seemed likely that they girls could not marry and would starve or be forced into a life of prostitution or slavery. Wanting to help, but not wanting to hurt the man's pride, Nicholas (who was the son of very wealthy parents, and had a great deal of money at his disposal), stealthily placed a small bag of coins** in each of the girls stockings that were hung by the fire to dry. The next morning, the girls and their father rejoiced in the miracle and at the saving grace. Word spread of Nicholas' kindness (though he demurred, saying that the thanks belonged to God alone), and people began placing their socks and stockings by the fire in hopes of a miracle of their own (or, some say, in tribute to the kindly saint). In the Germanic/Scandinavian tradition, the god Odin is actually credited with the present day stocking tradition. Odin- god of war, poetry, wisdom and magic - rode a white horse (named Sleipnir) that was able to fly and had eight legs ("...8 tiny reindeer..." anyone?). Children of this region would place their shoes out with straw, veggies and sugar near the window or hearth, as a treat for Odin's horse. In gratitude, Odin would exchange the Sleipnir Snacks for gifts and candy. (Many people believe this, eventually, is what led to the Cookies-for-Santa and Carrots-for-Rudolph tradition). 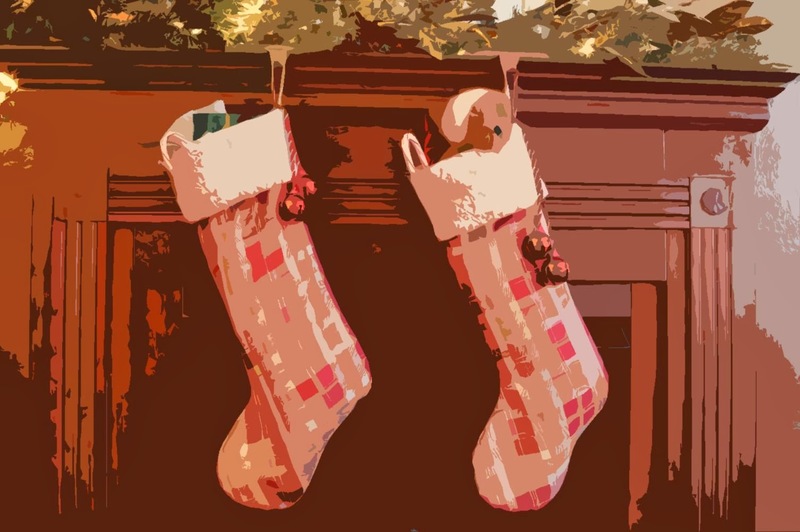 While German culture certainly has had a significant influence within America, it seems that the Turkish tradition may be the primary genesis for stockings in this country. In the 19th century, a man by the name of Clement Clarke Moore penned what would become one of the most famous poems of our time - A Visit From Saint Nicholas, later known as The Night Before Christmas. This fantastic literary picture of Christmas became so popular, that soon after MANY of the actions mentioned in the verses were copied in Victorian homes all across the nation. Arguably the most notable? "...The stockings were hung by the chimney with care; in hopes that St Nicholas soon would be there..."
This Christmas, when you leave out veggies for those magical sleigh pulling reindeer and a platter of sweets for the big man himself; and when you hang your beautiful, brightly colored stockings on the hearth, the stairs, the bedpost or the wall - you're taking part in a tradition that has been happening (in one form or another) for hundreds of years, all across the world. So take a quick moment to remember a humble old man who, whatever the truth was behind the folklore, now represents the kindness and generosity that makes this season magical. Or remember a Nordic god who enjoyed war and encouraging his freakish horse to eat out of strange kids shoes. Whatever jingles your bells. 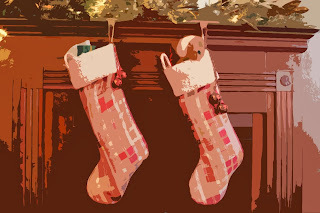 Check out Stockings: Just Stuff It for great ideas on how to fill your Santa Socks! Collins, Ace. Stories Behind the Great Traditions of Christmas. Grand Rapids: Zondervan, 2003. "Christmas Stockings." Wikipedia. Wikimedia Foundation Inc. 2013. Web. Webley, Kayla. "A Brief History of Christmas Traditions." Time. Time World, 22 December 2010. Hey guys! My name's Emily-Grace and I'm so glad you've found my blog! E.G. is all about decor, entertaining, laughter and finding joy in the everyday. The meaning of the name is threefold: 1. "Entertaining" in the sense of providing for guests. ("Hey, come on over for dinner and I'll break out the good mason jars and moonshine...") 2. "Entertaining" is also meant to indicate my love of laughter ("That Emily-Grace. She's hilarious. And she should quite possibly be medicated.") 3. And finally, "Entertaining GRACE" is about the idea of granting each other a certain amount of kindness, mercy, and tenderness. This world can be a tough old bird and the truth is, we're all in it together. When we take the time to celebrate the bright moments we magnify that light to the people around us and, hopefully, add some hope and joy to their lives (as well as our own! ).